1. Watch good movies for free. Emory Cinemathetique’s fall series on “Resisting Fascism” offers classic films every Wednesday for free. Screenings are in Room 208 of White Hall at 7:30 p.m. It’s BYOP(opcorn) or latte or other family-friendly refreshment. Films this month include “The Stranger” (1946) with Orson Welles screening Oct. 4; “Naked Among Wolves” Oct. 11; “Army of Shadows” on Oct. 18; and “The Conformist” on Oct. 25. 2. Enjoy free concerts, from Jazz to Hindustani music. This month offers campus concerts across a wide range of genres, so you can check out your favorite styles or stretch and listen to something new. There are two opportunities to experience Jazz on the Green: Thursday, Oct. 5, and Thursday, Oct. 19, at 6 p.m. on Patterson Green. Bring a blanket, a picnic and some friends. The Astor Duo, harp and flute, perform on Wednesday, Oct. 11, at 8 p.m. in Emerson Concert Hall of the Schwartz Center for Performing Arts. A special performance of Hindustani music will be Thursday, Oct. 12, at 8 p.m. in Cannon Chapel. Rabindranath Goswami and Ramchandra Pandit, visiting artists from India, will play the sitar and tabla. Karen Freer will give a cello recital on Sunday, Oct. 15, at 4 p.m. in Emerson Concert Hall. 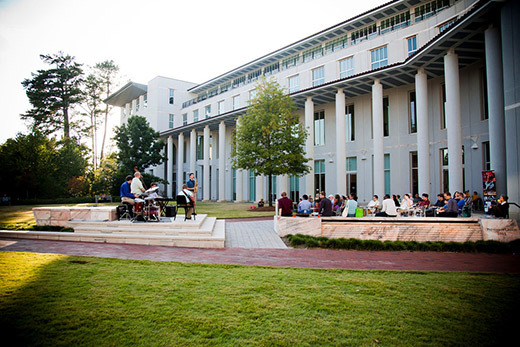 Don't miss concerts from Emory's musical performance groups, also in Emerson Concert Hall. Emory Wind Ensemble will perform on Friday, Oct. 20. The next night, Saturday, Oct. 21, the Emory Concert Choir will sing, and on Thursday, Oct. 26, Emory University Symphony Orchestra will join Emory University Chorus there. All performances are at 8 p.m. The Emory Chamber Music Society of Atlanta features Edoardo Catemario on guitar on Friday, Oct. 20, at noon in Ackerman Hall of the Michael C. Carlos Museum. Two genres share the program in Jazz Meets Classics – Songs of Love on Saturday, Oct. 28, at 8 p.m. in Emerson Concert Hall when tenor Bradley Howard sings songs of love by Schumann, Rachmaninoff, and Puccini accompanied by pianist William Ransom interspersed with jazz love songs sung by Johnaye Kendrick with Gary Motley at the keyboard. 3. Cheer on Emory’s Eagles at home games for volleyball and soccer. Emory's volleyball and soccer teams are off to strong starts, and it is especially fun to bring young friends and family members who play these sports to see what it is like in Division III college play. All events are held at the Woodruff PE Center and all are free. On Thursday, Oct. 5, the women’s soccer team takes on Huntingdon College at 7 p.m. Both the men’s and women’s soccer teams play New York University teams on Friday, Oct. 13. The men’s team plays at 5 p.m. while the women’s game is at 7:30 p.m. Men’s soccer continues on Sunday, Oct. 15, with an 11 a.m. game against Brandeis University; the women play Brandeis at 1:30 p.m. The women’s soccer team plays on Saturday, Oct. 21, against Roanoke College at 1 p.m. The men’s team plays Berry College the next day, Sunday, Oct. 22, at 2 p.m. The volleyball team will play Maryville College on Friday, Oct. 6, at 6 p.m. They also take on Washington & Lee later in the month on Friday, Oct. 27, at 4:30 p.m. On Saturday, Oct. 28, the Emory Invitational pits the Eagles against Berry College at noon and Webster University at 3 p.m.
4. Take a docent-led tour of the Reformation Exhibition. "From Wittenberg to Atlanta: The Richard C. Kessler Collection at 30 Years" is on display through Nov. 27 at the Pitts Theology Library in the Candler School of Theology. Two docent-led tours on Oct. 6 and Oct. 20 give viewers background and information on the works being shown. These include woodcuts by German Renaissance painter and printmaker Albrecht Durer; medieval manuscripts from the 12th century; and a manuscript in the handwriting of Martin Luther who sparked the Protestant Reformation. Pending docent availability, tours can be arranged at other times during library hours. 5. Swim in the fall at the SAAC. The pool at the Student Academic and Activity Center on the Clairmont Campus is open until Nov. 1 and is heated throughout October to a minimum temperature of 78 degrees, a perfect reminder of summer on warm, sunny fall days. If you are not a member of the SAAC, you can pay a walk-up fee of $10 per swim or buy a 14-visit pass that averages just under $9 per visit. Passes do not expire so any remaining swipes can be used when the pool reopens April 1, when, again, it will be heated to 78 degrees. 6. Meditate to sacred sounds during a month-long series. Come to Cannon Chapel, Room 106, every Tuesday throughout October where sound and Reiki practitioner Gabriel Nelson Sears will facilitate Sacred Sound Meditation sessions using Tibetan singing bowls, crystal singing bowls, chimes and drums. These and other percussion instruments create harmonious overtones and sound vibration for deep relaxation and meditation. Wear loose comfortable clothing and bring a yoga mat, pillow or blankets, if you want, to enhance your experience. The sessions are free. 7. Hear artist photographer Hugo Fernandes talk about his “Intimate Strangers” series of portraits. In his "Intimate Strangers" portrait series, Hugo Fernandes explores anonymity, intimacy, sexuality and digital culture. On Wednesday, Oct. 11, the photographer and Rose Library curator Randy Gue will discuss the series, which Fernandes created by initiating meetings with men through online and app-based cruising sites to set up photo shoots. The Rose Library has a set of "Intimate Stranger" chromogenic prints.The free talk is at 6:30 p.m. in the Woodruff Library’s Jones Room. 8. Discuss Mary Shelley’s “Frankenstein” in light of the current world of genetic engineering, robotics and nano-technological implants. Mary Shelley’s classic novel raises questions that remain pertinent today. Ponder questions of human nature, “playing God,” the nature of monstrous, and our ethical responsibility to future generations as you read the novel and discuss it over four Monday evening sessions beginning Oct. 16 at 7 p.m. at the Bill and Carol Fox Center for Humanistic Inquiry on North Decatur Road. 9. Walk over to the fifth annual Open Streets Emory Village. Open Streets Emory Village, a vehicle-free, family-friendly event, will be Sunday, Oct. 29, from 2 p.m. to 6 p.m. Check out the dining and retail spots, new and familiar, in the Village, while enjoying the entertainment. The streets will be filled with local performers, the popular dog costume contest, a puppet factory and, being so close to the day, a Halloween parade. 10. Take a break to get moving. Go on your own or meet colleagues by joining a walk through Lullwater Preserve on Wednesdays at noon. Meet Me @ Lullwater events feature activities and themes to enhance your outdoor time. BOLO for fall foliage. Meet at the gates to the Preserve entrance for this free and healthy activity.